My heart sank when I heard the news that a local police officer had been killed in the line of duty. I was not on call that day but I knew exactly what the words “he was taken to a local hospital where he was later pronounced dead” meant. As trauma surgeons we provide care for those injured in senseless, often preventable ways daily. But when an officer is stricken it hurts in so deeply because we share a position with them at the forefront of the worst that happens in our society. Let me assure you, there was not. As with all trauma centers, we have a comprehensive morning report where we discuss all of our new patients: what was the mechanism, how did they present, what was done for the work-up and subsequent treatment? So it was clear that the trauma team did everything they scientifically or physiologically could in this case. In morbidity and mortality* terms, this would be a ‘non-preventable’ death. In a statement to the press less soon after losing her son, the officer’s grief-stricken mother was quoted as saying there is “no respect for police anymore” suggesting perhaps that a pervasive devaluing of law enforcement by society might be at the root of her son’s preventable death. She was no doubt alluding to the national discourse evolving in recent years due to some high profile episodes where the actions of responding officers have been questioned. Some actions have been proven to be criminal by our justice system, as in the case of an Oklahoma City Police Officer who serially raped women he had pulled over, in other cases, however, the facts in support of criminal behavior beyond a reasonable doubt are less clear (e.g., Officer Parker of Madison, AL and Mr. Sureshbhai Patel; or Officer Wilson of Ferguson, MO and Mr. Michael Brown; or Officer Pantaleo of New York, NY and Mr. Eric Garner). Clarity notwithstanding, there has seemingly been a shift in public rhetoric questioning of infallibility of those on the front lines of law enforcement. Sadly, in some cases the rhetoric has escalated to vitriol, rioting, and even directed acts of violence against law enforcement. It truly is maddening that a man, fueled by the overarching discourse questioning police intentions and behavior, would then seek an opportunity to kill the police as in the case of Mr. Ismaaiyl Brinsley who gunned down Officers Wenjian Liu and Rafael Ramos of the NYPD, not during the act of apprehension or while committing another crime, but just because. However, no matter what the headlines are, the overwhelming majority of our men and women in blue are good men and women who take on their duties with the best of intentions and model professional behavior. And so, when this good man’s mother cites this volatile discourse as a possible cause of his death—as much as my heart breaks for her—it hurts our community by suggesting a local conflict where there was none. By all accounts, the cop killer in this case was a sociopath lacking any respect for human life or the laws of our society in general as evident by a lengthy record replete with charges ranging from cocaine trafficking, to assault & battery, to weapons possession. Those of us who are not career criminals might get tachycardic or diaphoretic during traffic stops but our natural instinct is to reach for our license & registration, not for our gun. A man with no moral compass felt cornered and so he fired; but, this was no more because he was cornered by an officer than if I had made some gesture to this armed and dangerous criminal during my nightly dog walk. So, while a family, a profession, and a community mourn, I urge each of us to contemplate how the criminal justice system might have functioned differently to prevent this senseless tragedy but to avoid stoking fired up rhetoric that pits people against the police and police against the people. Discourse that drives us apart stands in the way of viable solutions to combat the socioeconomic and psychological factors that may drive one to a lifetime of crime in the first place and to take those who cannot be rehabilitated off the streets before another preventable death, be it of an ordinary citizen or a man/woman in blue. *Morbidity & Mortality, or M&M as it is called is a weekly conference held by surgical teams to review all deaths and complications in an effort to learn more about the systems-based and disease-based processes that led to the adverse outcome. 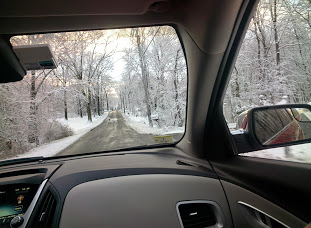 My part of the country has been pummeled with snow in the recent past. Many local school districts had to cancel school 4-5 days in just over a week due to two substantial storms. The forecasters are predicting yet another 12-18 inches just in time for the start of the next school week. At this rate, we might be sending our kids to school on the 4th of July! Yes, there are lots of reasons to sigh about this, even among the most ardent of winter warriors and snow lovers. There are already 50+ inches of snow outside my door (not including the plow piles, many of which reach well above 6 ft). 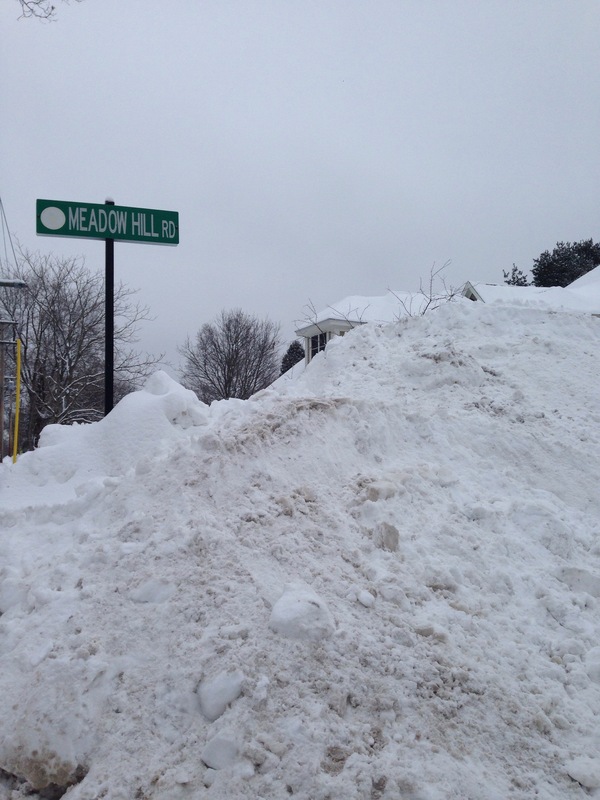 There is nary a sidewalk or shoulder to be found. Many local roads can only accommodate one way traffic at a time and turning corners is down right hazardous with all the obstructed views. All of this danger is when the snow isn’t actively falling, when the winds are not whipping flakes into a fury, when a slick, slushy layer is not sticking to the roads. When the bad weather is actively happening things get really hairy. And it’s typically on these days, when conditions outside really compromise the safety of kids at bus stops or walking to school or of any vehicle or persons on the road, that we get a snow day. The other day, on the heels of our many recent snow days, the local NPR station had a whole call in segment on the burden of snow days on families. Caller after caller lamented the challenges for working parents, single working parents, parents of disabled children, parents without telecommuting options, parents with part-time or hourly jobs (who simply don’t get paid if they don’t go into work), parents whose own parents can’t provide back-up childcare…. It went on and on. The radio hosts and some callers discussed viable options for snow days such as alternating days with neighbors so that at least some of the folks in the neighborhood could go to work. Others spoke of progressive employers who offer on-site back up childcare or access to on-demand in-home care through external agencies. Some suggested schools should stay open despite inclement weather to provide kids safe place to be in a storm and make sure they don’t go hungry. I suppose I should have been sympathetic to these snow day woes and interested in the proposed solutions as the parent of two school aged children who often must be at work no matter how inclement the weather is, but instead I was bothered by the idiocy of it all. It looks peaceful but the roads are treacherous. I know what it’s like to have to travel through treacherous conditions to get to work. I own an all-wheel-drive car. I live close to work. I know enough to leave plenty of time. Yet, I have still experienced my life passing before my eyes as I slip, slide, and fishtail the 4.5 miles to work on those days when patient care requires me to be at the hospital. I know what it’s like to hunker down at work with 4 days worth of clothes and rations when anticipated conditions suggest it would be unsafe for me to travel back and forth from work. I have no choice. This is what I signed up to do. You may need me, and I will be there for you in the trauma bay. But you know what…don’t the majority of us have a choice? In fact, should it even be a choice to put oneself and others at risk if what you are going out of doors for is considered non-essential work (to use a state of emergency term). I know that nearly 100 people died with thousands more injured during the Blizzard of 1978. I know that the pro-active state of emergency declarations due to accurate prediction of epic storms (yah 21st century weather forecasting technology!) in the modern era (first, two years ago this week and again last week) has kept many people safe. I know this because I had to be at work and it was eerily quiet in the trauma bay. I also know that on these other days of seemingly non-epic storms, when the predictions for danger aren’t as dire, that the ED is like a war zone, filled with people who ventured out only to get injured, some in fender benders and others in major pile ups. I know that some of those injured people die no matter how hard we try. I know from my most recent call on a snowy, though not state of emergency, day what it’s like to code and code and code a 30 year old whose Civic was no match for a semi on a treacherous interstate, only to declare him dead. I know the sinking feeling of getting that message that your child’s school bus has been in a crash on a day that school was not cancelled despite the falling snow. (Luckily it was minor and no one was hurt but it could have been very different with 40 kids piled into the ED and the trauma bays instead of driving their caretakers up a wall at home on a snow day). My daughter’s bus stop circa this morning. No where to stand. So that’s the thing about snow days. I get that they are inconvenient all around. But it’s not just about keeping our kids safe, not just about the walkers who don’t have cleared side walks or lack of space at designated bus stops. It’s about the safety of everyone else around us too. To me, preventing one injury, even one death, is worth all the inconveniences. Back-up employer-based childcare (though wonderful when your nanny gets sick on a normal weather day) involves putting both you and your child (children) at risk on the drive to your workplace. Calling in a care provider in a pinch puts that person on the road and then you too will make have to make your way to work in poor conditions. As we learned this week, public transportation isn’t always a viable option to avoid the roads and be safe. Similarly, while the carpooling equivalent of watching kids on a snow day in the neighborhood seems great, how would the ones who drew the short stick and got stuck with the kids (this to me was the tone of the call in show) feel when the other mom or dad across the way never came home that night (and not because they were on call at the hospital)? Are these inconveniences too terrible in the name of safety? Because I do believe that if it’s too dangerous out there to get our kiddos to school then it’s likely too dangerous for the rest of us (unless, of course, you are a considered an essential worker like I often am). What does it say about our world today that in some districts families are so strapped to put food on the table that putting kids in harm’s way in order to be fed is preferred over a snow day? Why do we tolerate employment policies that punish the least affluent among us in hourly or part-time jobs with lost wages (or worse, threats of termination after so many missed days) for something as legitimate as unsafe travel conditions? Are those industries not involved in the assurance of public safety (our dedicated fire, police, and EMS providers) and necessary urgent/emergent/long-term care (our inpatient, ED, and SNF/LTAC/home services nurses, doctors, aides, etc.) so important that they can’t take the financial and/or productivity losses of a few extra snow days here and there to have fewer injured (or possibly dead) employees? Parking for many of our surgeons inaccessible. Notably, many healthcare systems are no better, keeping their elective schedules and outpatient clinics running despite inclement weather. Yes, there is pressure to attain patient satisfaction but why should we put all the doctors, nurses, admins, patients, and families at risk for hernias, and wound checks, and well visits, and routine follow-ups for chronic diseases that could easily wait for another day. Yes, that means when the next clinic day or OR day is quintuple booked workers will have to work harder and stay later and patients/families will have to be more patient but at least we won’t be coding someone who was headed in for a non-life-threatening issue during a snow storm. Those unfortunate enough to experience life threatening issues on those days will have access to the rest of us fire, police, EMS, ED staff, trauma surgeons…. I promise. So, when our superintendents who have considered the forecast, reports of road conditions from our DPW, and the possibility of keeping the schools open until July give our kids a snow day, why not just declare it a snow day for everyone except those few essential workers who must compromise their own safety to get to jobs that provide services for everyone else’s safety and well-being? 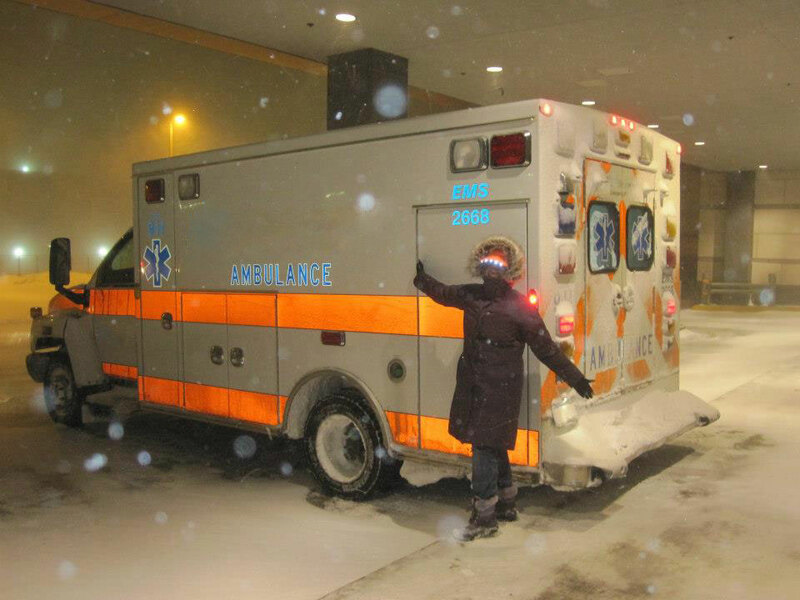 Me in the trauma bay during Storm Nemo, February 2013. 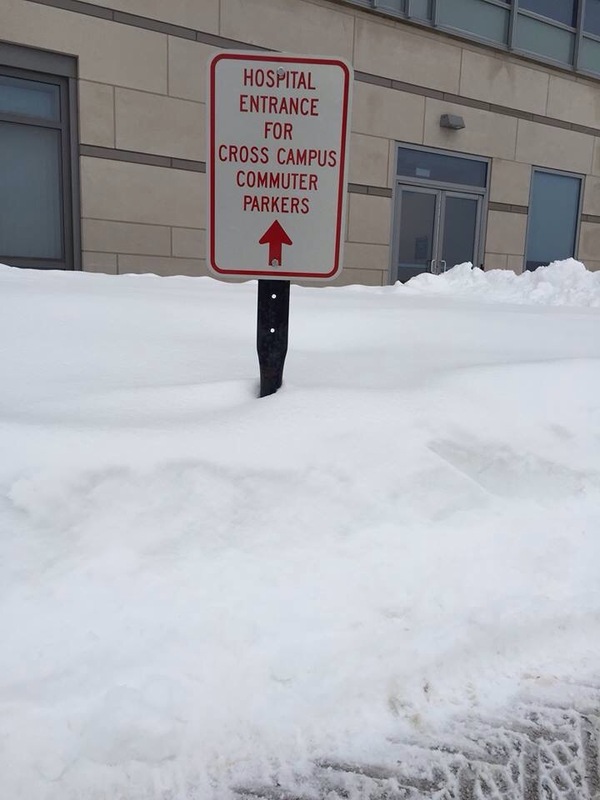 Not every storm warrants a state of emergency and not every snow fall warrants a snow day. And depending on where your home is located relative to your workplace, the two may not both be experiencing the same weather conditions. But when things are rough out there, let’s quit complaining about the burden of snow days. As a whole we need to exercise more common sense and implement policies that keep families and workers (even if they don’t have school aged children) safe and out of the trauma bay.